Buying paintbrushes for acrylics can be a bamboozling experience when it's your first time, but I'm here to help! 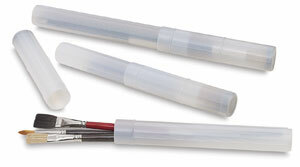 This article will give you a clear introduction to selecting paintbrushes to use with acrylics. If you're a beginner it's hard to know which combination of shape, size and brand suits your needs. Don't worry, you'll understand paintbrushes for acrylics better as you gain experience. 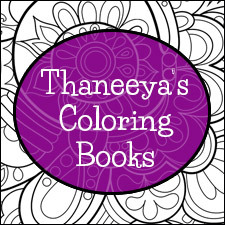 For now, this page will give you some help selecting your first brushes so you can just start painting! For a more detailed look at paintbrushes for acrylics and how to clean and care for them, see my guide to paintbrushes. 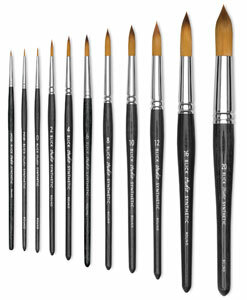 For more info check out Blick's Brush Shape Chart. It might take you a little while to remember which brush is which. For now, lets break it down like this. There are two main brush shapes: (1) Rectangular and flat, and (2) round and pointed. 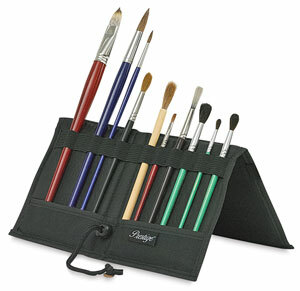 Flat or rectangular brushes have square, flexible ends and can hold a lot of paint. When used flat, they can make long strokes and are well suited to blending and painting in large areas. The tip and sides can also be used for more delicate lines and small touches. Round and pointed brushes have a large belly that tapers to a fine point. They're capable of bold strokes that can cover large areas, yet they can also render fine lines and details. As your skills broaden to encompass different techniques, you'll need to accumulate most brush types - but if you're a complete newbie you can start off with as few as two brushes: a mid-sized flat brush and a mid-sized round brush. 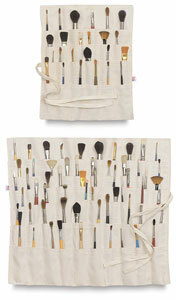 large-size brushes for painting large areas and washes. You'll notice that some paintbrushes for acrylics have short handles while others have long handles. Brushes with longer handles are useful for easel work, when you want to paint from a distance that allows you to see the whole work at once. Start off with mid-sized brushes (sizes 6 to 8) and then branch out according to the needs of your painting style and the flexibility of your budget. The bottom line is that you can use all kinds of brushes with acrylic paint but there are a few differences to be aware of. 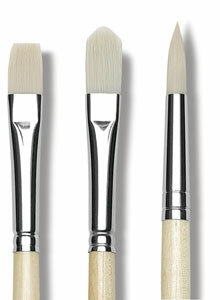 While natural-hair bristles (like the stiff hog bristle and soft sable) are commonly recommended for oil painting because they cope well with the heavy texture of the paint and maintain their shape even after many uses, brushes with natural hairs can be damaged by acrylic paint over time. Plus, they don't like sitting in water. Synthetic bristles, on the other hand, come in a range of stiff and soft varieties (usually made from nylon or polyester) that quite successfully mimic the feel of natural-hair bristles. They're more suited to acrylics because they cope well with the acrylic resin, are easier to clean, and don't mind sitting in water. They don't hold their shape quite as well as natural-hair brushes, but they're still quite durable (if cared for properly) and usually cost less. 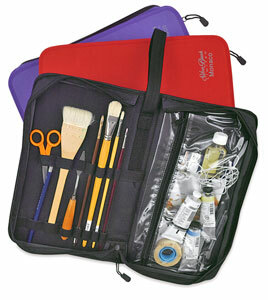 Therefore, I recommend you buy synthetic paintbrushes for use with acrylic paints. You can still use natural-hair brushes on acrylics, but make sure that they've been cleaned of any oils or turpentine (which will repel acrylic paint) and be sure to clean them quickly after each use. There are lots of different brands and some are very expensive, so the best buy depends partly on your budget. I commonly use Princeton and Loew Cornell paintbrushes because they're inexpensive and durable. If you're looking for something a little more upmarket I've had good experiences with Da Vinci brushes. It's usually cheaper to buy paintbrushes for acrylics online, but first you might want to go into an art supply store so that you can feel each brush with your own hands. There you can test a brush by pressing the bristles against a flat surface, looking to see that the bristles do not bend too close to the ferrule (the metal part holding them in place). Check that the bristles retain their shape and make sure there isn't a gap between the bristles and ferule, where paint could accumulate. You can save some money by buying the cheapest paintbrushes (even household brushes) to use for underpainting or applying very large swaths of paint. When painting with fast-drying acrylics it's possible to destroy a brush in mere minutes (if paint dries on the bristles, for example), yet with the proper care you can preserve them for years! Some brushes are expensive, so it's definitely worth protecting your investment. 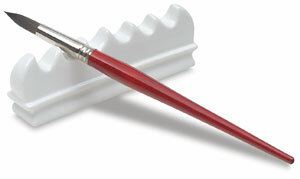 For detailed instructions on how to care for your paintbrushes for acrylics, see my How to Clean a Paintbrush page. It's also important to store your paintbrushes properly so that the bristles don't get bent of out shape. Scroll down to see some of the options. 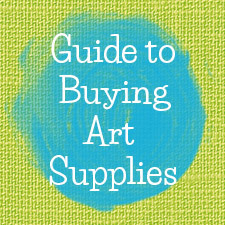 The Recommended Products below are there to help you browse for art supplies, and if you make a purchase we get a small commission that supports this site and keeps it FREE! Thanks in advance. If you make a purchase after clicking on my affiliate links, I get a small commission that keeps this site up & running and free for everyone! I've recently enjoyed using the Maestro Series XV Paint Brush Set with acrylics. 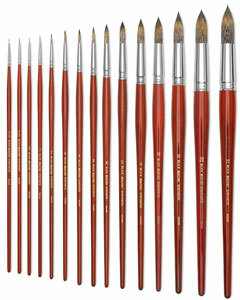 This set of 11 synthetic paintbrushes and 4 hog hair paintbrushes can be used with acrylics, gouache and watercolors, which makes them both versatile and affordable. I've tried them with both acrylics and watercolors and found that they hold up well for use with both. 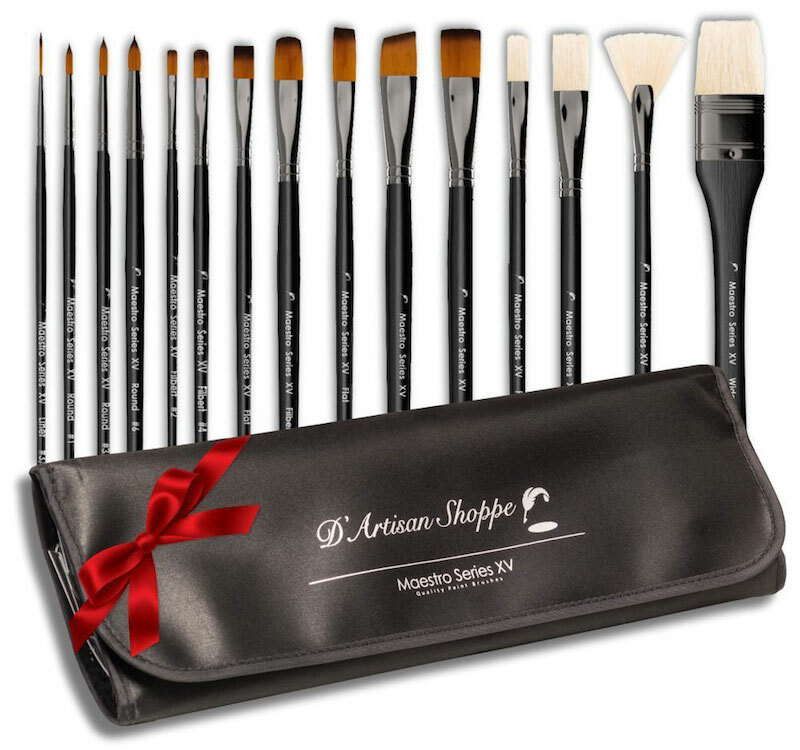 This set is an affordable starter kit for those just starting out and they're also great for seasoned painters like myself who appreciate a range of good quality brushes at a very fair price. 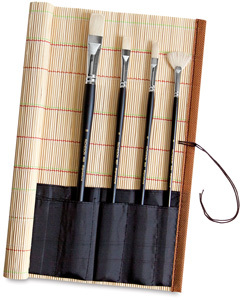 The Minute Series XII Paintbrush Set is perfect for painting small and/or delicate details. This set of 12 high-quality synthetic paintbrushes includes flats, pointed rounds, and liners that work well with acrylics, gouache and watercolors. You can also use them for painting models, small figurines, dollhouse furniture, rock art, and any painting where tiny details are needed. 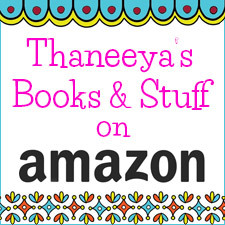 They come in a plastic holder that stands upright, along with a bag for keeping them dust-free.